Walter Kintsch grew up in Austria and received his doctoral degree from the University of Kansas in 1960. After a postdoctoral fellowship at Indiana University, he held faculty positions at the University of Missouri (Columbia), University of California (Riverside), and Stanford University, before settling with his wife and lifelong colleague, Eileen Kintsch, at the University of Colorado at Boulder in 1968. Walter’s 50 years of research has focused on issues surrounding text comprehension, knowledge acquisition, and mathematical models of cognitive mechanisms. The interdisciplinary scope of his research has had a tremendous impact on cognitive science, discourse processes, psycholinguistics, and education. 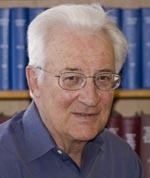 Walter Kintsch has written several landmark books and articles in Psychological Review that shaped the direction of fields. The representation of meaning in memory (Kintsch, 1974) highlighted the semantic structure of language and challenged simple associationist views of memory and comprehension. Kintsch and van Dijk (1978) provided the first psychological process theory of discourse comprehension and his Construction-Integration (CI) model (Kintsch, 1988, 1998) is currently the dominant psychological model of text comprehension. His book Comprehension: A Paradigm for Cognition (1998) articulates the CI model and reviews how the model explains a wide range of phenomena, including reading comprehension, comprehension of arithmetic story problems, planning and performance on routine computing tasks, and retrieval structures in expert memory. Walter Kintsch’s influence on the field of Cognitive Science extends beyond his own work. Walter served as the director of the University of Colorado Institute of Cognitive Science (1983- 2004), an interdisciplinary center drawing in faculty from psychology, computer science, linguistics, education, environmental studies, and business. He served on the Cognitive Science Society Governing Board from 1979-1985 and 1988-1996, and as Chair in 1984. Walter was the editor of Psychological Review from 1988-1994. He is a Fellow of the Cognitive Science Society (2004), a Fellow of the American Psychological Association, (1977), a member of the National Academy of Education (1992), and a Fellow of the Center for Advanced Study in the Behavioral Sciences (1981 – 1982). He has been recognized with the MERIT Award from the National Institutes of Mental Health (1987), the Distinguished Scientific Contribution Award of APA (1992), a Lifetime Achievement Award from the Deutsche Gesellschaft für Psychologie (2002), and the Distinguished Scientific Contribution Award of the Society for Text & Discourse (2008), and the Distinguished Scholar Lifetime Achievement Award of the National Reading Conference (2009). * The FABBS Foundation would like to thank Dr. Arthur Graesser and Dr. Danielle S. McNamara for nominating Dr. Kintsch for this honor and for leading the effort to spread the word about his nomination. Would you like to honor Dr. Kintsch? It’s not too late to have your name added to the list of donors! You can make your donation to Dr. Kintsch’s In Honor Of… campaign at anytime.